Many parents have a concern about the chemicals that are in regular laundry detergents. The harsh chemicals can easily cause skin irritations and allergic reactions in your baby. For this reason, baby detergents were invented that did not have the problematic ingredients in them. There are several different baby detergents on the market that parents can choose from to wash their baby’s clothing and blankets in. Because babies have such sensitive skin, using regular detergent can be way too harsh and cause rashes and irritations. These top rated baby detergent choices are customer favorites and we’ll share with you the features and benefits that make them favorites. The top rated baby detergents we have reviewed below are popular names in the baby detergent industry. They are all created with ingredients that are safer for little ones and that don’t cause the problems that regular detergents do. Using baby detergent is one way for parents to eliminate some of the harmful chemicals that their babies can be exposed to on a day to day basis. 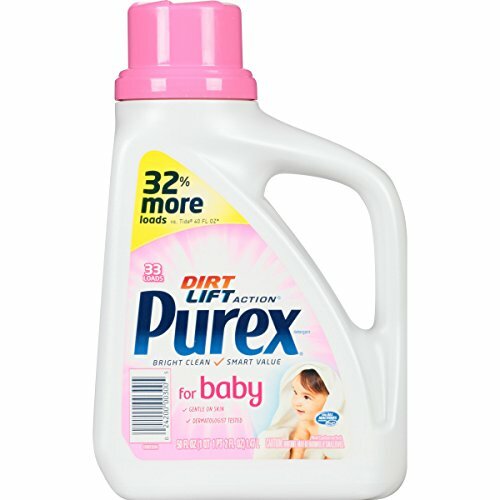 Purex is a well known name in detergent and they have a baby detergent too. This hypoallergenic baby detergent has been dermatologist tested. The light fragrance is perfect for babies clothing and doesn’t leave heavy perfumed smells. Ultra Purex Baby Detergent is perfect for all types of baby clothing and will not damage the flame resistance that some sleepwear has. It is important nowadays for parents to find safer alternatives to the chemical filled choices on the market today for things like detergents, lotions, shampoos, etc. This ultra Purex baby detergent has done that by providing a detergent that you can feel good about using on your baby’s clothing, bed linens, blankets and soft toys as well. 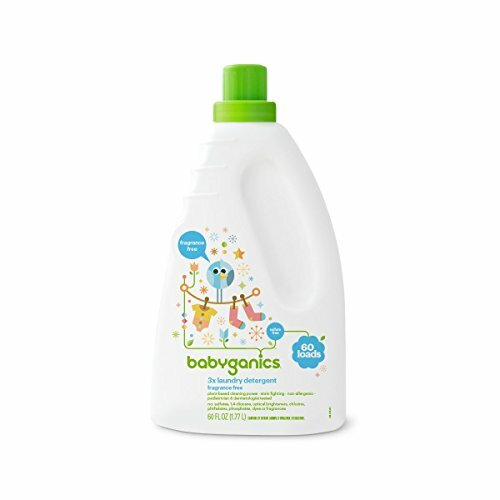 Parents get a two pack of 50 ounces of baby detergent which is enough for plenty of loads of baby clothing and bedding. You will love the fresh, light smell of your baby’s clothes and will feel better knowing that you are using a detergent that is specially formulated for baby items. 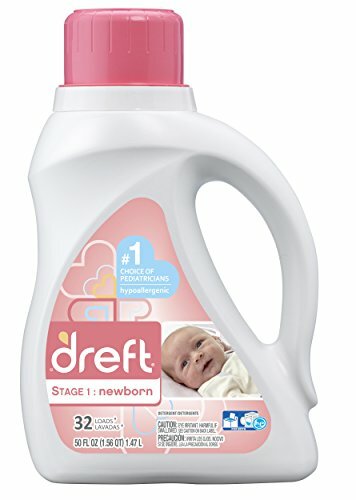 Dreft is possibly the most well known baby detergent on the market. It is the #1 pediatrician recommended baby detergent and is hypoallergenic. This Dreft stage 1: Newborn HE detergent works in High Efficiency washers and is the perfect choice for washing your baby’s clothing, bedding and soft toys. Dreft doesn’t have to be just for your baby’s clothing and bedding, you can use it for the while family. It is also dermatologist recommended and is very unlikely to cause any kind of rashes or skin irritations with your baby or other children, even if they have sensitive skin. Dreft Stage 1: baby detergent is recommended by Pampers and the Dreft name has been a trusted name in baby detergent for over 80 years. They have the kind of history that inspires confidence that the product is safe and healthy for all of your baby’s clothes and bedding washing needs at all ages and stages of development. Look for the Dreft laundry stain remover as well for getting out those tough stains nothing seems to work on. Don’t think that just because you choose a baby detergent that you have to sacrifice cleanliness. The super cleaning formula of Babyganics 3X Baby Laundry Detergent is strong enough to get all of your baby’s clothing, blankets, sheets and soft toys clean and sanitary. This safe for baby detergent, is sulfate and 1,4 dioxane free. It is full of plant and enzyme based cleaners that attack dirt and stains and gets rid of them in short order. You won’t find any chlorine, phthalates, phosphates, fragrances, dyes or optical brighteners in this baby detergent either. As a result, it is also non-allergenic and very unlikely to cause any skin irritations or rashes. This baby detergent from Babyganics has been pediatrician and dermatologist tested for purity and safety in relation to being used to wash all of your baby’s linens, towels, clothing and toys. This detergent is also High Efficiency machine compatible. Add up all the clothing, bedding, cloth diapers if you use them, towels, bibs, soft toys and more that you’ll be washing on a regular basis and you will see the important of having a safe baby detergent that you can use to get your baby’s items clean without using harsh and dangerous chemicals that can cause skin irritations and rashes. The top rated baby detergents we have reviewed here are all well known companies with a history of performance and quality. Any one of these detergents will be a great choice to safely wash all of your baby’s bedding, soft toys, clothing and other items with ingredients that are hypoallergenic and recommended by pediatricians and dermatologists as well. Continue reading below to learn more about baby detergents and how to make sure that you have a good quality detergent that won’t cause your baby to break out in rashes. Our buyer’s guide arms you with the knowledge you need to get your baby’s belongings clean the safe way. Is Regular Detergent Bad for Babies? All regular laundry detergents leave residue on the clothes after they are watched and this residue isn’t visible so you may not have even known it was there. This residue can be a potential problem for your baby, causing skin irritations, allergic outbreaks and even eye irritations. The good news is that you don’t have expose your baby to these potentially harmful ingredients because there are plenty of baby detergents available that you can use to keep your baby’s clothing and bedding items clean and looking great. Baby detergent works great on the entire family’s laundry. You don’t just have to be a baby to have baby detergent using your clothes and getting them clean. If you find one that you really like, consider switching the whole family’s detergent needs to the baby detergent. When you start shopping for a baby detergent there are several things that you want to look for in the one you choose. There are basically three main characteristics of a great baby detergent. With all of the choices available, it can be a little confusing trying to decide which one to use. Most baby detergents are very similar, eliminating the same harmful ingredients from their lists. Gentle on babies’ skin –Babies have very sensitive skin so eliminating those ingredients that can cause skin problems can reduce the chances of your baby developing any rashes or irritations. Free of toxic chemicals – Look for baby detergents that are contain no dyes, phthalates, 1,4 dioxane, optical brighteners, bleaches, and other harmful chemicals. Effective for eliminating stains – With all of the things your baby can get on their clothing and bedding, you want a baby detergent that will get those stains out. There are several excellent, brand name baby detergents on the market, like the top rated choices reviewed here that will work great on the stains your baby’s clothing gets. Look for those that are also good at eliminating odors as well. Unscented and Fragrance Free – Any of the baby detergents you choose should be fragrance free and not contain any scent at all. Manufactured scents contain a lot of chemicals some of which are carcinogens. This is not something you want coming into contact with your baby’s delicate skin. Also remember that babies are not used to fragrances so perfumes and scented detergents can be overpowering to your baby. Free of these ingredients – In any of your baby detergents, look for those that do NOT have optical brighteners, quaternium-18, Sodium Laureth Sulfate, Sodium Laurel Sulfate, Formaldehyde, Bleach and Nonylphenol Ethoxylates; none of which are good to have anywhere near your baby. Always pay attention to the labels on your baby detergent bottles and when you have them at home, keep them up and away from all children. Rinses Clean – Make sure that the baby detergent you choose rinses clean and gets rid of all detergent residue which is harmful for your baby. This residue can cause allergic reactions in your baby. Another problem with this residue is that it allows dirt to adhere to the clothing quickly. Below are some valuable washing tips for your baby’s clothing, bedding and other washable items. These tips will ensure that your baby items are as clean as they can get. Wash all of the baby’s clothing and bedding before they use it or wear it the first time. This will get rid of any skin irritants that they encounter. If the clothing is already used when you get it, still make sure you wash it in baby detergent before allowing your baby to wear it or I was. Put all of the baby’s socks and small items in a mesh bag and wash them in that. It will prevent those small items from getting lost. Fasten all hooks or loops that could get caught on something and get damaged during the wash process. This prevents them from getting stuck in the tank somewhere too. Read the labels on your baby’s clothing. The majority of baby clothing is fire-resistant. Using things like bleach can reduce the fire-retardant properties and should be avoided. The temperature that you wash baby items should be between 85 to 105 degrees. The lower the temperature, the more money you will save on utilities used to wash these items. Babies get all kinds of stains on their clothing from eating, spitting up and accidents. You want to be able to get these stains out as much as possible. Below are some tips you can use to remove the stains on your baby’s clothing. The best way to remove stains thoroughly from your baby’s clothing is to wash it as soon as it gets stained or at the very least treat the stains right away fir washing later. Stains left to sit will become permanent, ruining the baby clothing. Protein Stains – Protein stains include breast milk, formula, baby food and feces. When any of the baby’s clothing or bedding has protein stains, soak the item or items in cold water with a product that contains enzymes. There are many natural products on the market that have these enzyme containing properties. Oxyclean has a baby product, so you may want to invest in this and pre-soak any items that have feces on them to remove all signs of the accident and the stains too. Urine – Not only can urine stain it can leave linger odors that won’t fully come out either. To treat urine stains and odors, mix 1 tablespoon of ammonia in 1 cup of water. Dab the mixture on the clothing in an obscure place to see if it damages the fabric. It all is well, go ahead and treat the stains with the mixture before washing. Baby oil – If you regularly use baby oil on your baby, they may get oil stains on their clothing and bedding. Use a regular stain remover and then wash the stained items with the hottest water you have available. Be sure to read the care tag as well so you wash the clothing and bedding on the right cycle. Fruit and vegetable baby food – Sometimes getting baby food stains, especially the orange baby food, can be a real challenge. Start off by rinsing the stained item with alcohol and water (1:1 ratio) and then wash the normal way you do using the baby detergent you have chosen. If it does not work completely, re-treat with a regular stain remover and wash again. Don’t put the items in the dryer until the stains are completely gone. You can also try vinegar and water with the same 1:1 ratio. Vinegar is also really good for eliminating odors. You may smell the vinegar while you are washing the item but by the time the cycle is done, you won’t smell the vinegar anymore. Diaper Rash Ointment – Normally this will not stain but if you notice stains from diaper rash ointments, look for stain removal information for that type of stain and follow the directions carefully. As a parent, you want to do the safest and best thing for your baby whether it’s your first one or your 6tth one. One thing that you can do to improve the health of the products you use around your baby and family is to use baby detergent for the whole family. One major reason to do this is that if your baby has skin reactions to certain things, washing your own clothes when the baby will be leaning against you, us also counterproductive. By ensuring that the baby detergent has a good reputation and performance (do this through the customer reviews that are put on the product page. These reviews can give you a lot of insight as to how well the product works when it comes to getting stains and odors out. The top rated baby detergent choices we have outlined here will be a great addition to your laundry room and will ensure the kind of safe laundry that you want for your new baby.